Today, Maine harvests over six times more lobster than what was harvested in the '80s. If you’ve been keeping up with some of the rare and unusual fishing hauls found off the coast of Maine, chances are you’re well aware of the bounty of exotic lobsters that the state is home to. 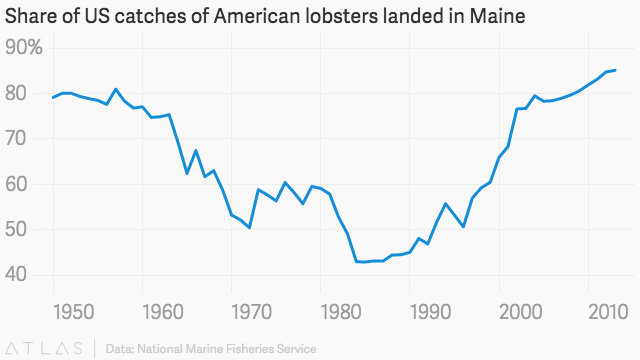 A recent article by Quartz gives an in-depth looking into both the rise and potential fall of the lobster industry. As the lobster population continues to grow, the crustacean has gone from what used to be a luxurious dinner choice to a fast-casual staple. Case in point: you can now find fast-food truck lobster rolls and the McDonald’s McLobster. Wild-caught lobster are typically more expensive than those that are farm raised, but in 2014 alone, fishermen were able to accumulate over 124 million pounds of lobster in Maine—that’s six times what was caught in 1984. Unlike other over-fished industries, the lobster population has been able to withstand the mass amount of fishing that has been done. With 85% of the lobster haul population coming from Maine, it’s worth taking a look at how the state differs in relation to other lobster habitats. With the mass amounts of lobster being hauled in Maine, it’s easy to come to the conclusion that sustainability precautions would need to be enacted. In the 1980s, biologist James Thomas explained that the current rate in which people we’re catching lobster was not sustainable. Yet today, Maine harvests more than six times what was harvested in the ’80s. The temperature of the water can contribute to the lobster population. Lobsters have taken a liking to the Gulf of Maine newfound warming waters, seeing that they thrive in water ranging from 41°F to 64.4°F (5-18°C). According to Quartz, before 2004, average temperatures in the Gulf of Maine had been notching up at a rate of about 1.8°F every four decades. Today, temperatures have begun to rise steeply, giving lobsters an opportunity to thrive and grow much faster. The mass amounts of lobster fishing has also had a beneficial effect on the lobster who are not in the allowed size range. By using herring as bait in lobster traps, the crustaceans that are caught by the traps that then must be released are given a free snack in the process, allowing them to get a free meal and grow in size. While it seems as though the lobster population is in a good place, an odd sensation related to baby lobsters has taken place. According to Quartz, from 2008 to 2013, the average number of eggs counted on a lobster’s underside declined by 30%—a drop of around 8-10% a year. This sensation is most likely caused by the increase in the Gulf’s temperature of water. Although it’s known that lobster do enjoy warm water, too much of it can be dangerous. This current decline in the baby lobster population can ultimately effect the population later on down the road. While we currently have the ability to harvest more lobsters than ever before, this downturn in the baby lobster population could eventually have a negative impact on the amount of lobsters available in the future.